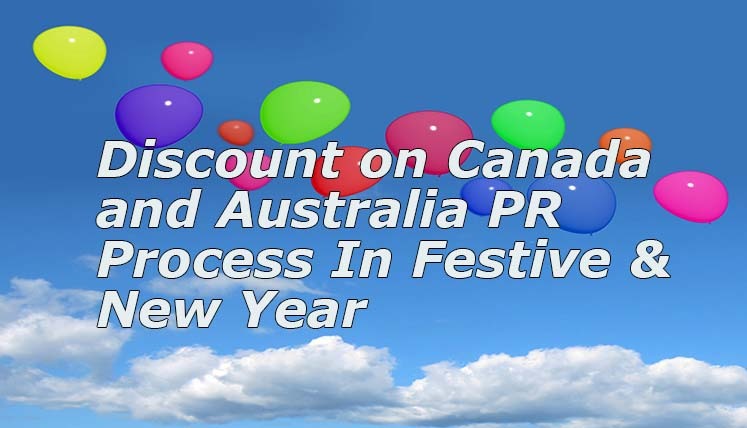 December 29, 2016, New Delhi, India– On the occasion of festive season and New Year, prominent Visa and Immigration Consultancy Service, Visas Avenue is offering a striking discount on its consultancy fees for Canada and Australia Permanent Residency (PR) process. The year 2017 is being considered as the best year for immigration to Canada and Australia and with proven and efficient immigration assistance from Visas Avenue, you stand a best chance to move to your destined country in the New Year. In short, you have a chance to get complete Visas and immigration process assistance from Visas Avenue at discounted fees and ensure your Visa approval for Canada or Australia immigration. Why year 2017 is Significant for immigration to Australia or Canada? The year 2017 is being considered as crucial for Canada and Australia immigration for various reasons. The liberal government of Canada has immigration target of about 300,000 for 2017. It means a huge number of immigrants under its economic immigration and family reunification program will arrive in Canada in 2017. Moreover, the government has also provided several relaxations in immigration rules to invite more and more applicants in Canada in the New Year. Australia is also looking to welcome a considerable number of immigrants in the year 2017, in view of ongoing skill shortage across its different states and territories. A significant number of jobs are expected to be created in Australia in key sectors, such as, IT, Accounts and Finance, Engineering, Construction and Manufacturing, Healthcare, etc. Visas Avenue is a registered and quite popular immigration and visa consultancy company in India. It provides complete immigration process support and assistance to a huge number of visa applicants every year and subsequently, helps them get the approval of their desired overseas visa. Every year, hundreds of immigration applicants immigrate to their destined countries, i.e. Canada, Australia, USA, UK, New Zealand, Germany, Hong Kong, etc. countries through the crucial immigration assistance from Visas Avenue Immigration. It helps applicants apply for different visa categories, i.e. PR Visa, Tourist Visa, Business and Investment category visa, Student visa, etc. Visas Avenue has its consultancy offices in different parts of India, i.e. Delhi, Bangalore, and Hyderabad. It will soon open its latest branch in Mumbai- the financial capital of India. If you wish to register for the discount offer, you may call at contact nos. 011-48447777, 011-46194650 (Delhi), 040-42467777 (Hyderabad), or 080-46668222 (Bangalore). To chat or message with the immigration expert at Visas Avenue, you may contact Skype Id- visas.avenue or visas.avenue1. You may also forward your immigration and visa process associated queries along with your details to Visas Avenue email id- info@visasavenue.com. How to Select the Best Visa Consultancy Service for Overseas Immigration in 2017?